One: The audience consisted of 7,000 Republicans. Two: The Speakers included Four star General Tommy Franks, the man in charge of both the Afghanistan and Iraq invasions and Julie Andrews, one of my many wives (in this case, in the Shrek movies). Three: Bakersfield has no fewer than SEVEN Basque restaurants! When I arrived at the venue, the 7,000 Republicans were being entertained by an elderly gentleman called Rich Little, at that time the most famous impressionist in America. I was on immediately after him, so I stood in the wings genuinely impressed by the extraordinary accuracy of his impersonations. The only problem was that after some time, I realised that every single person he was impersonating was dead. When he finished his set, I went on and asked the 7,000 Republicans for an extra round of applause for ‘Rich’ – America’s most beloved corpse impersonator! Well…. There’s not much overlap between Monty Python fans and Republicans, and most of the Republicans would have been armed, so I chickened out. I want a leader who is much more intelligent, well-informed and emotionally mature than I am so that he or she fills me with self-disgust and makes me feel like a barge rat. 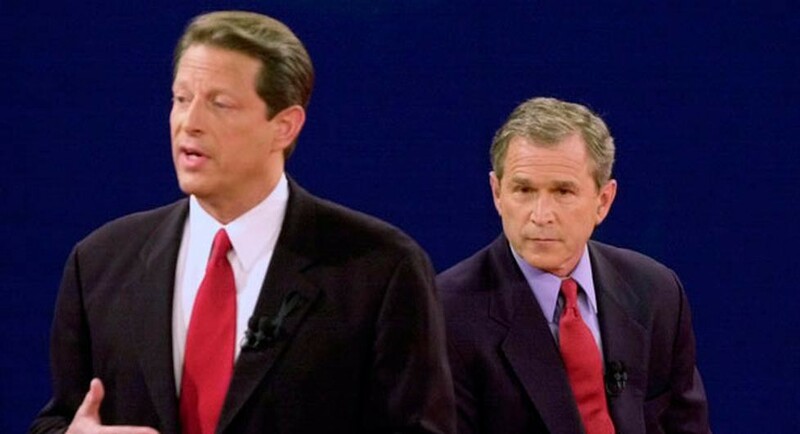 The previous evening there had been the first TV Presidential debate between George W Bush and Al Gore, so I ventured the observation that the taller one spoke better English, but that they, the audience, wanted the little one to be their next Prime Minister. They nodded and smiled, and I added that this was because they felt they could ‘have a beer’ with him. Again they nodded. I pointed out that they’d have a better chance of having a beer with the little guy if they didn’t elect him, since if he was President, he’d have less time for sitting around having a beer with strangers. But this was ‘The unconvincing of the 7,000’. They were determined to entrust the USA to a man who couldn’t speak properly, but who could only ramble. And then I had my insight. They’re not frightened by his rambling, because that’s how they all think! It’s not a question of an ‘inferiority complex’, it’s plain old-fashioned inferiority. It’s not a question of an ‘inferiority complex’, it’s plain old-fashioned inferiority. Trump supporters embrace red-blooded American capitalism, where competition tends sadly to produce winners and losers. And losers, naturally, do not want any ‘elitist’ reminding them of their status. It’s too painful, so they want leaders who do not remind them of their position at the bottom of the pile. They want someone exactly at their own level. I don’t. I want a leader who is much more intelligent, well-informed and emotionally mature than I am so that he or she fills me with self-disgust and makes me feel like a barge rat. Then I’ll be able to sleep soundly.